Lemon-Lime soda is the key to success in this blessedly simple and tasty drink. Try this experiment: Ask someone tending bar to make you a brandy old-fashioned. What may get placed before you will most likely be brandy (or cognac) subbing for rye in this iconic drink. Not necessarily bad (a complex brandy would make all the difference), but if the bartender handed this drink to a Milwaukeean, and told them what it was, she would take a sip then look at the bartender quizzically. 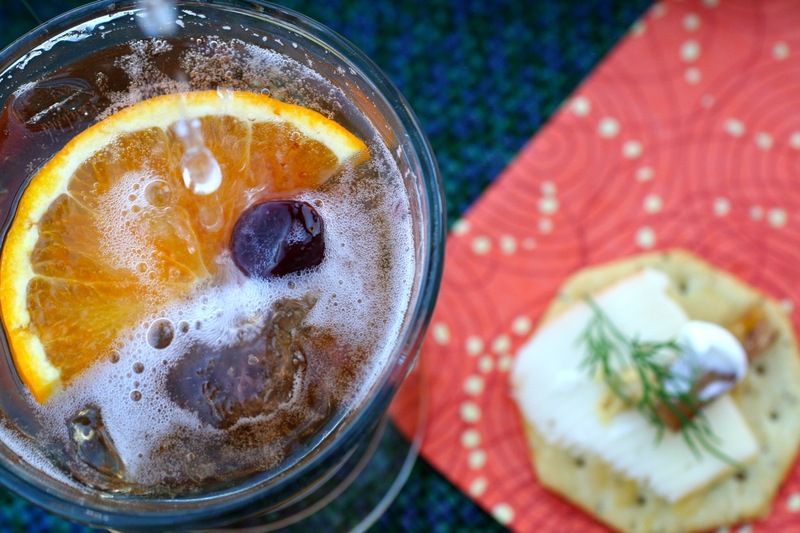 That’s because to your average Wisconsinite, the brandy old-fashioned is more like a highball, with a generous amount of lemon-lime soda and a few extra dashes of Angostura bitters added to the mix. And during a Milwaukeean’s Friday Night Fish Fry, when brandy old-fashioneds are poured faster than Laverne & Shirley can get into trouble, you would be hard-pressed to find another type of cocktail in someone’s hands (and if you did, you can bet they’re not from Milwaukee). Steve’s dad recently visited us, and for this former Milwaukeean, brandy is the king of spirits. Practically the only spirit. So we made sure we had a bottle of Asbach, a German brandy, waiting for him. It’s one of our favorites, with its rich, smooth taste, and almost buttery aroma. So making some brandy old-fashioneds seemed apt. The only problem was, we had no lemon-lime soda, and the various apps we prepared for cocktail hour were already laid out. Paul found a bottle of ginger ale in the fridge and quickly deemed it an acceptable substitute. So instead of just ginger ale, we decided to sweeten it up with some simple syrup (but not too much). After garnishing with a half-moon orange slice, and a cherry or two, we raised our glasses, took some big sips, and dug in to the grub. One of the stand-out pairings wasn’t so much of a shock, but unique in that the food was unusual: smoked eel. A little piece of this rich, unctuous fish goes a long way. Place a piece on a rich, buttery cracker, or a thick-cut potato chip, dab with a bit of mustard, then take a bite. Sip your brandy old-fashioned and relish the mingling of sweet and smoke. 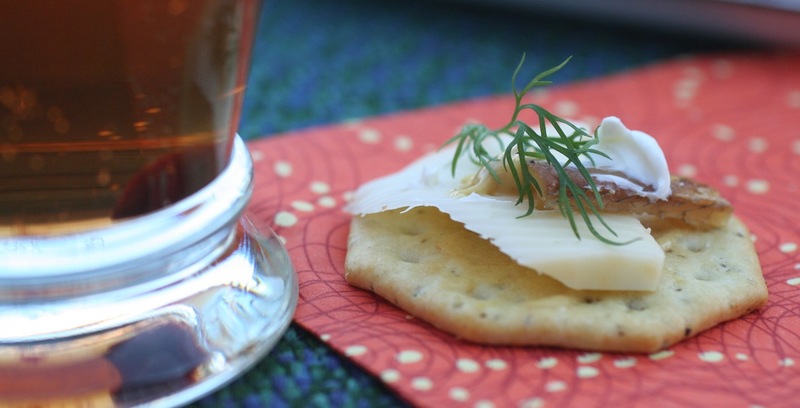 The woody flavors in the smoked eel hors d’oeuvres pairs perfectly with the sweet brightness of a smooth brandy old-fashioned. Stir the brandy and bitters (and simple syrup if you are using ginger ale) in ice for 15 seconds. Strain into an ice-filled double-rocks or highball glass. Top with soda and give a little stir. Add garnishes, preferably speared with a bartender’s straw. If using ginger ale instead of lemon-lime soda, use 1/4–1/2 ounce simple syrup, and after mixing, top with 3–4 ounces ginger ale. Place a slice of cheese and a piece of eel on a cracker or chip. Add mustard (and other condiments, if using). Note: If your eel seems dry from over-smoking (this usually happens when the eels are thin), chop it up into small pieces and spoon a little bit onto the cracker or chip. These beautiful fish, so sleek and snakelike, are born in the middle of the ocean and when they are tiny and glassy, make their way to shores across the globe, establishing homes in the estuaries of bays, and farther inland, to live out their lives, until it’s time to return to the ocean to spawn, then eventually die. Some eels can live up to a hundred years, if they are lucky enough to avoid weirs and, worse, man-made dams. Eels are the third most eaten fish in the world. The Maori of New Zealand revere the eel. It is godlike and respected. The Japanese are addicted to glass eels and pay a high price for shipping to their shores. Those of us who like Japanese cuisine probably have eaten unagi sushi, with pieces of succulent, slightly sweet eel, one of Paul’s favorites. Paul also grew up eating fried eel prepared by his grandmother. Much to his mom’s chagrin, his grandmother would take the eel and wrap its mouth around the spigot of the faucet, and flay it. After cleaning it, it got a dusting of flour and bread crumbs, then into the frying pan. Simple. Delicious. For the squeamish, we recommend an easier approach. The worst you may have to do once you’ve decided on serving smoked eel is to skin it (easy, if it’s not overly smoked), fillet one half by running a knife down the length of the eel just above the spine, then remove the spine. Wash your hands afterward with some lemon juice to get rid of the smokiness. A little work, yes, but the rewards are priceless.